Jackie's back, and he's brought some friends. Jackie Estacado hasn't exactly had an easy life. 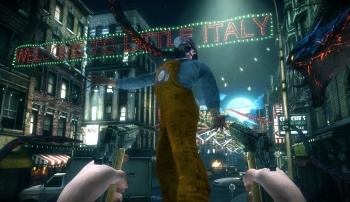 In The Darkness, the 2007 game adapted from the comic book series of the same name, Jackie was awakened to his powers, which allow him to wield the Darkness (but not always control it). In the midst of figuring out how to use this half-blessing-half-curse, his girlfriend Jenny is killed, and Jackie goes on a murderous spree trying to get revenge on those responsible. The Darkness II picks up two years later, as I saw in a hands-off presentation on the E3 show floor today. Jackie's back, and in the section of the game we saw, he was hanging out at an abandoned carnival, along with several members of the villainous Brotherhood. Though the members of the Brotherhood also have supernatural powers at their disposal, the Darkness-laden antihero made short work of them. Not only can Jackie use one or two guns, he also has two demonic arms that can slash enemies, eat their hearts, and snap their spines. This quad-wielding mechanic allowed Jackie to mercilessly kill his enemies in interesting ways, which earn more points used for upgrades. We got a quick look at The Darkness II's progression system, which has four branches; today we saw the Gun Channeling section, which, as you may have assumed, allows Jackie to channel the power of the Darkness through his weapons for even greater power. The upgrades are definitely incentive to get creative with executions; why just shoot someone when you can have one of your Darkness arms rip out his heart? While quad-wielding and demon arms are certainly a unique approach to first-person shooters, what interested me is that like the first game, The Darkness II seems to be able to maintain the tone of the comic book. Jackie's not a nice guy; he's a killer. A killer with a mission, sure, but a vicious guy nonetheless. His Darkling, though, offers some dark humor, and often converses with Jackie, sometimes arguing, sometimes mocking him. Unlike in the comics, where Jackie has a swarm of Darklings, the game has one, who follows him around like a buddy. That light-hearted banter lets us see just a little bit of humanity in Jackie Estacado, as well as showing us that the game doesn't take itself too seriously. The art style was also designed with comic books in mind, with hand-painted textures meant to look like the pages of a comic come to life. The abandoned carnival was appropriately creepy as a setting, and the ever-present demon arms constantly remind you that the game has a little something extra. Even though The Darkness wasn't a perfect game by any means, it was a good adaptation, which is something that can rarely be said with videogames. The Darkness II looks like it will, at the very least, deliver an experience that fans of the comic series will be able to enjoy. I like that it brings different elements to the sometimes-stale FPS genre, though I'd like to know just how many unique Darkness executions can be pulled off, and how quickly they'll become redundant. After seeing the game, though, I'm even more curious about Jackie's next videogame adventure.